John is a multi-talented instructor who teaches guitar, five-string banjo, mandolin, fiddle, dobro, upright bass and other instruments. He has over thirty years experience as a practicing musician, and over four years of professional teaching experience teaching individual and group lessons. John graduated in May 2016 from CPCC with an Associates of Fine Arts - Music. 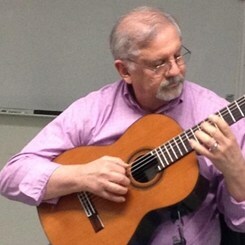 His studies include classic guitar, piano, music theory and music history - mixed in with plenty of solo and ensemble performances and recitals. John strives to make learning fun and rewarding. Students are encouraged to learn to share music with others and take fun advantages of technology to assist learning. Request Lessons with John today!